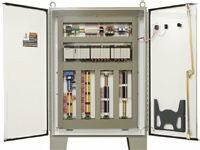 Rail Load Out systems start at just $25,000 – including the PLC and Enclosure! HMI (Human Machine Interface) is the software program that graphically displays the equipment that the operator monitors and controls. CompuWeigh’s preference is Wonderware InTouch, which is the World’s leading HMI system. Because we install so many of these systems, we are able to provide custom solutions using our library of pre-tested ‘intelligent’ objects. This dramatically reduces programming time, long startups and eliminates software bugs that are so prevalent with other systems. PLC (Programmable Logic Controller) is a specially designed computer for use PLC in industrial environments that interfaces to the equipment and field devices. A PLC system consists of a processor, communications modules and I/O modules. CompuWeigh uses the latest PLC technology from industry leaders like Allen Bradley’s ControlLogix and CompactLogix. We mount the PLCs in steel enclosures where I/O modules are pre-wired to terminal strips for easy connection of the field devices by the electrical contractor. Our control cabinets are built at our factory and are UL approved for wiring and construction methods. CompuWeigh’s Industrial Computer is a specially designed workhorse for harsh environments and has a number of advantages over a standard PC including, shock mount suspension, heavy-duty fan, filtered air supply and lockable access door in an Industrial UL listed steel enclosure. 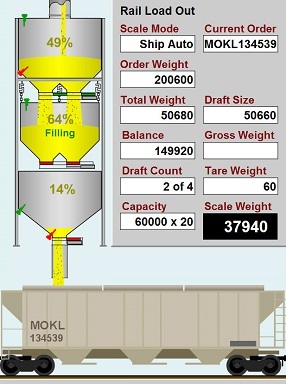 A unique benefit is that the GMS-4000 bulkweighing computer can simultaneously run the HMI application. This eliminates a whole computer system from the normally cramped Control Room.